Why are they missing the mark? It may be because many organizations are embarking on digital transformation journeys without a clear vision or confidence in their ability to succeed. Their results are unlikely to be satisfactory—which means these organizations aren’t undergoing digital transformation, after all. To set your business up for a successful outcome, you need to take a step back and reevaluate. You should begin with a clear understanding of what, exactly, digital transformation is. Robin Gareiss, President and Founder of Nemertes Research, defines digital transformation as “the innovative application of technology to improve something that ultimately drives value.” The most important part of this definition is that the new technology drives value. Gareiss stresses that if no value is derived from the technology investment, digital transformation has not occurred. This shines a light on how important it is to proceed with digital transformation only if you have a clearly defined vision and strategy. If you implement a technology to follow the hottest new trend, your organization may not be getting any real value. Your goal should be to take advantage of innovative technologies to grow revenue, delight customers, engage employees, and enhance your offers. As I said before, you should always begin digital transformation with a clear vision and strategy in mind. Determine which technologies have the potential to truly innovate your work processes and customer experience, and create a roadmap that details how the adoption of these technologies will take place to ensure pervasive and appropriate usage. Have a clear destination in mind, and identify landmarks along the way to help you determine whether or not you’re staying on course. It’s imperative that you get executive endorsement to ensure that you have the proper funding for the transformation. You also need a respected leader to act as an evangelist for your vision, as not only do you need top executives on board, but you also need your employees to join them. You may choose to implement an innovative technology, but if your employees are not willing or trained to adopt the technology, you won’t see results. That’s why you should engage your employees in this process. Give them a voice, listen to their needs, and foster a collaborative work environment. When facing stormy seas, listen to your captain and stay the course. Remember that digital transformation is a long-term investment, and you will not necessarily see immediate gains. In addition to rolling out the new technology, you will have to adjust your cultural, organizational, and business models—and this takes time and can cause unforeseen challenges. It’s important that you don’t head for the lifeboats and bail on the journey at the first sign of trouble, but instead persevere and listen to your digital transformation leaders. Address the challenges head-on and make the necessary changes within your organization rather than allowing weak points in your culture and organizational model to fester and divert your efforts. Your digital transformation efforts should ultimately result in an improved customer experience, so you’ll know you’ve arrived at the right destination when you see delighted customers. This includes your employees, who have adopted the new technology and adapted to the cultural changes to participate in a digital business. These are general guidelines for digital transformation success, but remember that every organization is different and you must create a specific plan that addresses your individual business needs. Digital transformation has the potential to bring tremendous benefits to your business, so it’s time to stop fearing it and start preparing for a successful journey to business growth. 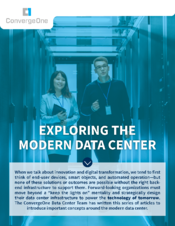 Is your data center keeping up with your digital transformation demands? Hassan Kassih -- Hassan Kassih is the Data Center Practice Director for ConvergeOne, leading a team of highly skilled data center solution architects. Hassan has more than 20 years of experience in building data center infrastructure and aligning IT with business outcomes. His expertise expands across all data center layers, including power, cooling, compute, storage, networking, virtualization, and cloud technologies.